The Knicks are back and have their sights set on making some noise in the Eastern Conference. Led by young talent and hungry veterans, New York will look to put the pieces together and make the playoffs in hopes of bringing home an NBA championship. The New York Knicks schedule shows that the team will have their work cut out for them during the regular season. Division rivals, the Brooklyn Nets and the Boston Celtics will look to stand in their way. Grab your New York Knicks tickets and head down to Madison Square Garden to cheer on your favorite team. The New York Knicks wasted little time in establishing themselves as one of NBA’s top dogs. They made it to the playoffs in their first season in 1946 and then went on to appear in the NBA Finals three times in a row in the 1950-51, 1951-52 and 1952-53 campaigns. So far, the Knicks have won two NBA Championships and eight conference titles. However, the team has been causing consternation among their fans since the 2013-14 season. In the 2017-18 campaign, they finished fourth in the Atlantic Division. It was also the first season the Knicks played without franchise player Carmelo Anthony who was traded to the Oklahoma City Thunder in the off season. Things may change for them this season though, as the franchise has the history of pulling off comebacks. The New York Knicks have given many memorable moments in the past. Here, we take a look at some of them. Lifting their first NBA Championship – In the 1969-70 season, the New York Knicks came close to making it to the NBA Finals but were overpowered in the Division Finals by the Boston Celtics, 4-2. This defeat did not slow them down and in the 1970-71 campaign, they returned with a vengeance. The team qualified for the postseason and won the Division Semifinals and the Finals against the Baltimore Bullets and the Milwaukee Bucks, respectively. They then crossed paths with the Los Angeles Lakers in the NBA Finals. The Knicks won the first game of the series. The Lakers won Game 2 but the Knicks once again asserted their dominance and emerged victorious in Game 3. Game 4 belonged to the Lakers but the Knicks bounced back and won Game 5. Now, the pressure was on the Lakers and they levelled the series, 3-3 by winning Game 6. This led to the deciding game between these two sides which took place on May 8, 1971 at the Madison Square Garden. The Knicks won that bout and lifted their first NBA title. Knicks end finals drought against the Bulls – Whenever the New York Knicks collided with the Chicago Bulls in the playoffs, the result had always been in the favor of the latter. That changed in 1993-94 season. That year, the Knicks once again went head to head with the Bulls in the Conference Semifinals but this time they won, 4-3. This ended the Bulls dominance over the Knicks. The New York Knicks have bitter rivalries against the Brooklyn Nets and the Boston Celtics. 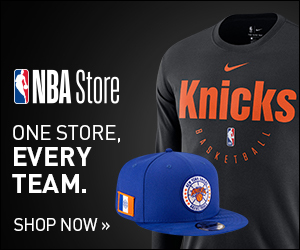 Knicks-Nets Rivalry – Often known as the ‘Cross-Bridges Rivalry,’ the New York Knicks and the Brooklyn Nets are division rivals as they both are the members of the Atlantic Division of the Eastern Conference. This rivalry started in 1976 when the Nets joined the NBA as a result of the ABA–NBA merger. Both teams have met each other three times in the playoffs so far out of which the Knicks have won on two occasions. These two sides last collided on February 1, 2017 where the Knicks emerged victorious, 95-90. Knicks-Celtics Rivalry – The New York Knicks and the Boston Celtics were established in 1946 and have since developed a fierce rivalry. They have encountered each other several times in the playoffs. New York and Boston are also rivals because they compete in the same division and have close proximity between them. Playing their home games in historic Madison Square Garden, the New York Knicks boast one of the great sporting venues on the planet. In the heart of Times Square, MSG is the home of the Knicks, the New York Rangers and the biggest concerts and events in history. The ''World's Most Famous Arena'' is the biggest basketball stage in the world and NBA players of all generations have relished the opportunity to play there. Get your Knicks tickets now and head to New York City for a basketball game that will be unforgettable! Patrick Ewing is one of the greatest players of all-time. He started his career by joining the team’s roster in 1985 and remained with them till 2000. During this time, Ewing played in eleven NBA All-Star Games. He received the NBA Rookie of the Year Award in 1986 and also made it to the NBA First-Team in 1990. Ewing’s efforts for the Knicks were acknowledged as the team retired his number 33 on February 28, 2003. Another star who played for the New York Knicks from 1967 to 1977 was Walt Frazier. In his time with the team, he appeared in seven NBA All-Star Games. In addition, Frazier was picked as a part of All-NBA First Team four times in 1970, 1972, 1974 and 1975. He was also selected to play in NBA 50th Anniversary All-Time Team. Who can forget Willis Reed? He also makes the list of the ‘Greatest Players in New York Knicks History.’ Reed found a spot on the Knicks’ roster in 1964 and remained with them till 1974. While playing as a power forward, Reed received The Bill Russell NBA Finals Most Valuable Player Award twice in 1970 and 1973. Reed also won the NBA Rookie of the Year Award in 1965. Moreover, he was also chosen to appear in seven consecutive NBA All-Star Games from 1965 to 1971. Since the 2012-13 campaign, the New York Knicks seems to have lost their momentum. They haven’t qualified for the postseason since. However, the fans are still rooting for their favorite team. Will the Knicks be able to deliver something special in the 2018-19 season? You can find out by getting your New York Knicks tickets 2018-19. Our process for purchasing cheap New York Knicks tickets is simple and fast. There are so many online ticketing sites, that it can be hard for customers to find the right place to buy New York Knicks tickets at the cheapest price. At ScoreBig we think of our customers first and foremost. We offer daily deals for New York Knicks events, so our customers can get the best seats for the best prices. ScoreBig will always go above and beyond to offer the cheapest New York Knicks tickets on the market. The New York Knicks schedule above, displays all available events for 2019 and 2020. Once you find the event that you would like to go to, click the red “Get Tickets” button. It is located on the right-hand side of the event listing, it will take you to an New York Knicks event ticket page. ScoreBig's event ticket page will display all available New York Knicks tickets for that event. On the event ticket page to help with your search for the right New York Knicks tickets, use the filters at the top to select quantity, price range, and more. There is also an interactive seating chart so you can pick where you want to sit. When you are ready to buy a ticket, click on the listing, and you will be directed to ScoreBig's checkout page. Upon completion of the information fields, your order will be processed and your New York Knicks tickets will be delivered via email, mail, or to your mobile device. What makes ScoreBig’s site stand out from the rest? We are constantly analyzing our competitors to improve our site, service, and prices. ScoreBig.com employees strive to offer the best process and experience to buy cheap New York Knicks tickets. Our goal is to get you the best seats to New York Knicks events. We offer daily discounts on our site and for special promotions check out our newsletter. If there are no New York Knicks events currently available, you can use our search feature at the top of the page to see a list of all popular events going on near you. No matter your price point, we have all the best deals and discounts on New York Knicks tickets. For more information on prices of New York Knicks tickets and the schedule for New York Knicks, check out our listings above. The last thing you want to find out is when the New York Knicks event you wanted to go to is sold-out. Don’t worry in many cases ScoreBig has affordable tickets to sold out events. We sell tickets from GA all the way to premium seating and parking. Skip the scalpers in the parking lot and get your tickets online from top New York Knicks ticket brokers. We get you in all events, buy your New York Knicks tickets here from a brand that many trust and rely on for all their ticketing needs. ScoreBig offers a 100% money-back guarantee. If you have been in search of cheap tickets for New York Knicks, ScoreBig by far is the best option. That’s why ScoreBig has more loyal customers than any other ticketing site. Shop at ScoreBig for safe and secure New York Knicks event tickets.